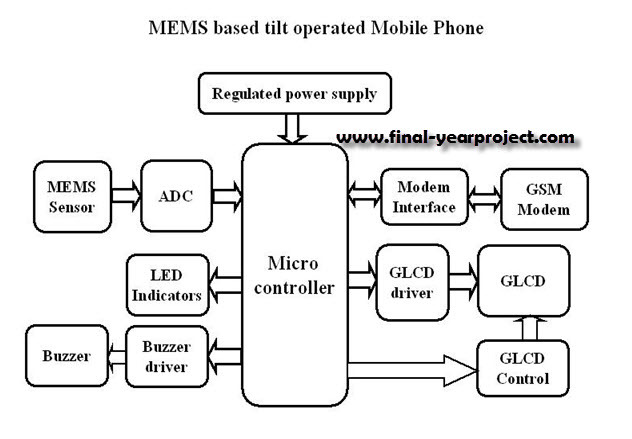 This is a good GSM based Electronics project on design and construction of tilt based touch free mobile phone. This project aims at designing a GSM mobile with the help of a MEMS sensor to help for a friendly hardware interaction for the user. This kind of hardware interactions are made possible with the help of the MEMS technology. AT commands are used as communication protocols in this project. You can also Subscribe to FINAL YEAR PROJECT'S by Email for more such projects and seminar. 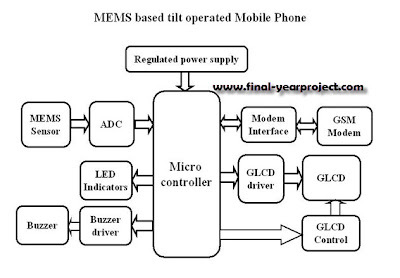 The above image shows the block diagram of MEMS based tilt operated Mobile Phone. The project has been developed by integrating features of all the hardware components used. The report contains full microcontroller programming and it future scope. Use this report for your reference and study.